Alice In Chains: "It hurts and you miss them, but you still have to live"
This is not what we expected. Alice In Chains – that growling, mournful monster of a band, masters of melancholy; a group besieged by the demons of huge loss and the weight of years spent in a swirling vortex of substance abuse and successful trappings – actually seem happy to be here. Cantrell and Kinney are sitting in a cavernous studio in downtown LA with fellow chain-smokers bassist Mike Inez and new AIC frontman William DuVall. This is the first time they’ve saddled themselves with an interview of this kind on the cusp of a new release that no one saw coming, least of all them. It is, dare we say it, a jovial atmosphere – a combination of childlike anticipation and an overriding hunger to define themselves in the aftermath of the death of Layne Staley, their former singer who died a recluse of a cocaine and heroin overdose in 2002, years after the band unofficially dissolved. You only had to witness the exuberant reception that met the reunited Alice In Chains on the live circuit a few years ago to understand that survival is possible, that life does go on. But if you’re wondering whether Alice In Chains are feeling a little insecure about how they’re remembered, how their music fits into the grand scheme of things and how to move forward, then consider this: until this month they hadn’t released a record since 1995. It’s a whopping 22 years since Seattle cohorts Jerry Cantrell and singer Layne Staley formed the band, 19 years since their We Die Young EP and then Facelift took the airwaves by storm and put Alice In Chains – and Seattle – on the map. Six Grammy nominations, three studio records and eight platinum certifications later, they unofficially disbanded in 1996 because, as they’ll admit today, their associated addictions would have killed them had they continued. But if their de facto reunion in 2005 for a tsunami benefit concert heralded an unabashed return to public view, then their re-formation tour in 2006 with long-time comrade William DuVall upfront was where the next chapter began. Surely they must be surprised to be sitting here as Alice In Chains, with a new album in the can and a new man at the mic? “Well actually, we’re making it up as we go on,” Cantrell says with a grin. “To put all that weight on Will’s shoulders is unfair. We’re just figuring out how we work as a team. Although the band has changed, we’ve lost Layne, we’ve added Will, and there was no master plan. Playing again in 2005 felt right, so we did the next thing and toured. We did it step by step. It’s more than just making music, and it always has been. We’ve been friends a long time. We’ve been more of a family than most, and it had to be okay from here,” he says, pointing to his heart. They got back together. They toured again. But, until recently, even the band themselves didn’t see a new Alice In Chains album on even the most distant horizon. And yet here it is: this month sees the release of Black Gives Way To Blue. The process of songwriting for the new record was handled piecemeal, and Black Gives Way To Blue is very much an amalgamation of riffs and lyrical themes that, as Jerry explains, have been bubbling under in his mind for some time, and the lightning-rod effect of AIC’s three surviving members taking the stage carried with it the spark of creation. “It was when Jerry played that down the phone to me that I knew we had something,” adds Sean. And, more than the album, the loss of Layne Staley still haunts the conversation, and the band’s decision to re-enter the studio in October 2008 with William DuVall wearing Staley’s shoes brought about mixed reactions. To some it was met with jubilation – a band who traded in searing distortion, colossally heavy riffs and even weightier lyrics were returning to the fray with new material. To others it was as if they’d just seen an ex-partner out with someone new. The latter is a sensation that isn’t lost on Alice In Chains themselves. There’s a pregnant pause in the conversation, a gap where Sean’s own bandmates seem a little taken aback by what he’s just said. A beat passes, then two, and a smile spreads across Jerry’s face. “Well said,” he confirms. Of course, regardless of AIC’s intentions in the studio, DuVall has some very big shoes to fill. The combined titanic force of Cantrell’s tortured guitar wail and ghostly harmonies with Layne Staley’s booming croon are the essence of their mesmerising sound. So it’s impressive that William DuVall – striking in appearance, and at 41 looks 15 years younger – has stepped in. Formerly frontman/guitarist with Atlanta rockers Comes With The Fall, he’s not without his own musical pedigree. Most notably he became a collaborator with Cantrell in the tail-end of the 90s when – due to Layne Staley’s increasing reclusiveness – the guitarist needed someone to resonate with creatively. 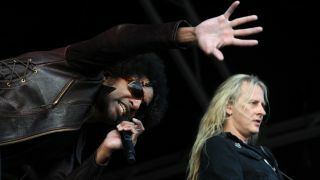 What became Black Gives Way To Blue was an idea that the band grew into, as Alice In Chains were under no compulsion to release an album. It was – as Jerry explains – more a drive to experience catharsis. As recently as 2007 Sean Kinney revealed that he would like to write a new record – but not as Alice In Chains. This, however, was an idea that was quickly overridden as the energy of those shows – 86 in all and covering 22 countries – signalled to all concerned that they were ready to head back into the studio. As a statement on Layne, it works on two levels – his final predicament, and the band’s decision to move on. This article originally appeared in Classic Rock #137. For the story behind Alice In Chains’ Rooster, then click on the link below.